Made Up Of Kiln Dried Chemically Treated Thick 18Mm Sheesham Wood.Set Of 3 Tables In Walnut Matt Finish.Legs 5Cm Thick. Uber cool and undeniably convenient, the Mexico Solidwood Nest of 3 Tables makes for the perfect selection in the modern day household. Buy this piece for yourself, or choose to gift it as a housewarming present – this is a piece that everyone will love. It’s beautiful, classic appearance and choice of wood makes it a universal favourite. Sheesham is well known for its durable and enduring qualities. Add to this, the dynamic furniture piece can expand into three individual units, making it super convenient and appropriate for any household. You can choose to buy this piece from our online furniture site, or visit any of our 25 furniture stores across India for the best deals in home furniture. Thank you for choosing Evok furniture. 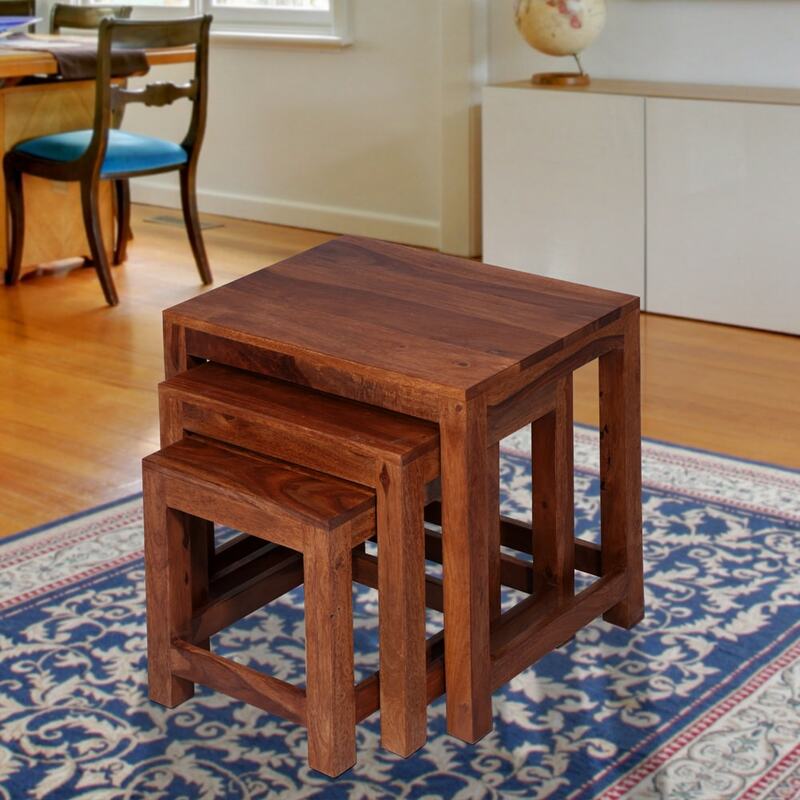 Quality wood furnishings are an investment that you expect to last a long time. To maintain its natural beauty and protect your investment itâ€™s important to know about your furniture and how to care it. Wood furniture is coated with a plasticized film that's referred to as finish. Besides enriching the grain and adding lustre to solid wood furniture, the finish seals and protects the wood from moisture, dirt and regular use. These finishes are diverse and vary from simple nitrocellulose lacquers to more complex polyester resins. All modern wood furniture finishes are long lasting and provide the protection your furniture needs. The grain patterns on wood may vary depending on the species and way in which it is seen for example, Sheesham is grown across several regions of India, each with unique mineral soil compositions, resulting in grain pattern structures that are just characteristics of the natural beauty of the wood. Some furniture is deliberately aged to give it a more rustic feel. The appearance of timber surfaces will soften and mature over time. The gloss levels on new furniture will initially vary from pieces that were previously purchased. You may find differences in the grains pattern. This is natural effect developed during the growth of tree. The older section of tree develops thicker, Cleaner grain patterns. Your Furniture may be made from serval cuttings of the different tree creating the contrast of markings. This is the inherent feature of solid wood Furniture and not to be seen as a defect.